Hi again, I just finished Andre Price's tutorial on creating fire in Blender. What an awesome tutorial it is too! 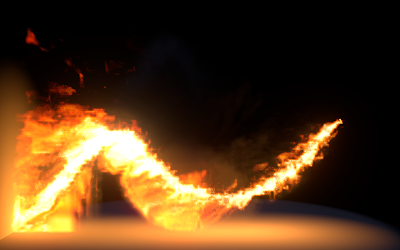 I highly recommend it to all those who would like to add a bit of fire effects in their scene. Before doing this tutorial, I think it helps if you know a bit about particle systems in Blender beforehand. Also, it would not hurt knowing a bit about Compositing Nodes, since Andrew rushes a bit through that part, although admittedly the Node setup used in this tutorial is very simple. The main part of the tutorial consists of setting up smoke in Blender—fire is basically smoke with a rendered with a volumetric material that changes color according to density. The basic object for creating smoke/fire is a "domain," which is an object, like a cube, that restricts the smoke simulation to a specific part of the scene. I did not render the whole animation, just a frame. I could've gone for a higher resolution smoke, but my computer is not extremely fast, and baking the smoke takes a while—about one hour for 120 frames, or 5 seconds of animation. Here is the result.